Home / Blog / Experience Korean food culture in Gwinnett, we did! Experience Korean food culture in Gwinnett, we did! 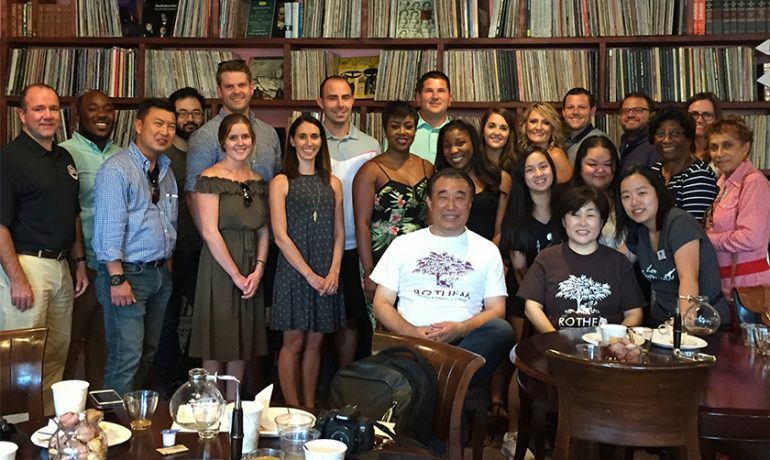 The Seoul of the South food tour can be explained in one statement: A day filled with working on your pronunciation of Kam-Sa-Hap-Ni-Da (thank you) to show gratitude for mouth-watering cuisine and world-class service! JS Kitchen by Jang Su Jang, a casual eatery with mind-blowing flavors and vibrantly colored dishes. From Bossam (steamed pork belly) to Haemul Pajeon (seafood scallion pancakes), you’ve got to try it all! Currently, the flavors of JS Kitchen can be found on Satellite Boulevard in Duluth but soon you’ll be able to enjoy their second location, which is slated to open in Gwinnett and is expected to include cooking classes and more highly anticipated dishes. At the second stop we dove into simmering soups at Seo Ra Beol, a Korean BBQ spot open 24 hours. At Seo Ra Beol, it became evident that a true Korean meal is complete when you bring together an assortment of side dishes to compliment the deliciously marinated meats. Whether it’s the restaurant’s renowned Gal Bi (beef short ribs) or a Gyeran-Jjim (steamed egg), the flavors all come together to redefine barbeque as a cultural staple. In addition to mouthwatering dishes, visitors can can enjoy a state-of-the-art karaoke system for all those late nights out with friends. Like most cultures, there are many ways to appease the inner foodie, the Harue Food & Café, combines comfort and street foods to make your taste buds go insane! Share a plate of Korean Fried Chicken with any stranger and you’ll become instant friends. Harue Food & Café is the haven for the undercover foodie, with such a diversity of options, it’s easy to grab lunch and stay until dinner. The final stop of the tour, captured the inner bookworm at Café Rothem, a cozy good vibes spot for anyone seeking a place to bring a good book and order generous amounts of delicious Yuja-cha also known as a citron tea! Their locally acclaimed Korean pastries and red bean waffles are complimented by the backdrop of a massive collection of vinyl that makes Café Rothem a Gwinnett-must see! By the end of the day, your fellow tourists will feel like family and your waistline will feel a bit tight! Trust us and step outside of your comfort zone to experience one of the fastest growing communities in Gwinnett. To keep up with the tour and other Explore Gwinnett activities click HERE.